5 Reasons Why Resolutions Will Always Only Look Good On Paper With every new year comes ambitious new (and recycled) resolutions. But what if you've bitten off more than you can chew, setting yourself up to fail? We make them, with good intentions, at the beginning of every year over leftover New Year turkey and wine (or whatever is left over at yours) and promise ourselves that we will keep them till the end of the year. You may be one of the few that even map out strategies for keeping your New Year resolutions but the resolve to keep almost always melts sometime in July. Here’s why your resolutions never make it till the end of the year and how you can change that. 1. Out of sight is out of mind. By the 6th or 7th of January when work or school starts, Lagos traffic, angry drivers and longsuffering pedestrians make you start forgetting the clean little sheet of paper you slipped into your journal New Year’s Eve. June comes and you don’t even have the time to glance through your list while brushing your teeth in the mornings anymore. If your resolutions aren’t somewhere you can see often enough, you will forget them quickly enough. Scribble them on sticky notes on your bathroom mirror, in your cubicle at work, on the first page of your dayplanner. Doing this helps you visualize your goals. 2. Unrealistic never cuts it. These will all look very good on paper and, of course, you want to be able to achieve your goals eventually. But if you aren’t any closer to your goals this year than you were 5 years ago, how on earth do you think you can achieve them in less than 365 days? It’s great to have long-term goals like the ones listed above (except the one about your mother-in-law, of course) but it is even better to make mini goals that will help you achieve your long term goals. If no one but you knows that you’re trying to lose weight, you can’t really blame relatives when they send you red velvet cake for your birthday. Having one or more persons who hold you accountable and help you keep your resolutions is grossly underrated. We celebrate our friends and family when they get new jobs, cars, get engaged, get married, have kids, lose weight, etc but we don’t do the same for ourselves when we take one pizza slice less than we would have last year. We don’t reward ourselves with spa treatments when for one month straight we give 100% at work (a lot more than we did last year). Consciously rewarding yourself for achieving “mini goals” gives you a sense of accomplishment and psyches you up for your next goal. 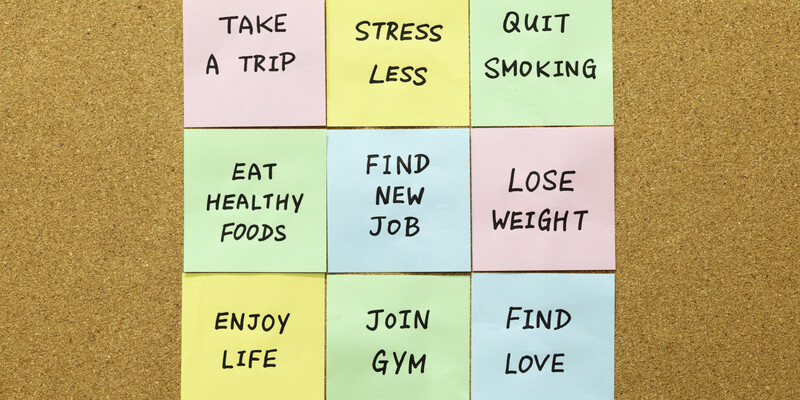 It’s the second week in January already but it’s not too late to review those resolutions. They just might work this year!